Fall Fun at Dilworth Park! Raise your mugs and toast to the changing season. 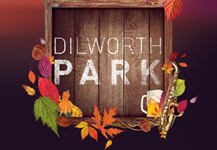 Dilworth Park provides the suds, the soundtrack, and the action to keep you warm all autumn long, with a lineup of entertainment and fun, right alongside historic City Hall. PNC presents Live @ Lunch returns September 9 with performing arts on the city's center stage. Rhythms and CCD Sips at Rosa Blanca Café continue well into September and the weekly Farmers' Market will be there all autumn long. Plus, Octoberfest presented by Saul Ewing is just around the corner! Get dates, details and more, at DilworthPark.org/events. Yappy Hours at Dilworth Park! Center City District Sips ends Wednesday! On September 2, 5-7pm, Center City bars and restaurants offer $5 cocktails, $4 wine, $3 beer and half-priced appetizers. For participants and specials, visit CCDSips.com. This fall, designer fine jewelry brand LAGOS launches Black Caviar, their most innovative Caviar collection to date. This collection is comprised of sculptural and smooth ceramic Caviar beads adorned with radiant 18k gold and brilliant diamonds. Black Caviar is a collector’s piece, reinventing the classic Caviar stack in a fresh and modern way. Especially when paired with existing and new 18k gold, diamond and sterling silver styles. On Wednesdays, 4-6pm, The Market & Shops at Comcast Center offers something special to commuters. You can grab a delicious, ready-to-go dinner for two for $19.99. Termini Bros. has you covered with $5 dessert. You can pick up a complete meal and still make your train. Menus change weekly – go to TheMarketandShopsatComcastCenter.com for more information. Jefferson is hosting an open house on September 12 and 13, from 11am-1pm at their new Jefferson Urgent Care – Washington Square office. Stop by and take a look at this new addition to the neighborhood. Looking for some wedding inspiration, reputable vendors, or just a place to get started? Planning your unique wedding day should be a fun and enjoyable experience that you can share with your family and friends. On September 13, meet over 100 wedding professionals approved by David Tutera who are committed to helping you plan your special day. Make connections, be inspired, collect ideas, and save time and money in the process – this is Your Wedding Experience.